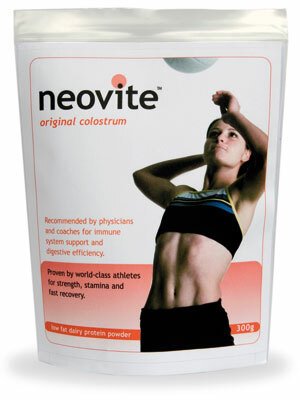 After talking to resident Triathlete Caroline Smith about the dip in the immune system post race she told me of the lesser known supplement neovite colostrum. This product, that comes from New Zealand, is made from the milk a cow has on the day it gives birth, that whole injection (or should I say ingestion?) of all the vitamins etc the calf will need to survive and grow strong. I ordered some off of Amazon but the company, based on London, only ship on Tuesdays and Fridays, and I wanted to lay down a week of taking it before Amsterdam and a week after. After one of my stroppy emails they sent it out immediately and it arrived today, the next day. The miracles of complaining. Anyway, it comes in 300g bags and is in powdered form. The fat has been taken from it too, so do not worry that it will affect your diet and you take 1 dessert spoon in half a pint of milk/water/yogurt or 2 spoonfuls if recovery from injury. I shall take 1 up until Amsterdam and 2 after, and will get my double marathoners to do the same. It is supposed to boost the immune system, improve performance, and rectify any issues with digestion. I am completely open minded and really want this to work, as no one likes being sick after a race, esp when there is another one just around the corner. Anyway, it is day 1, I added a single dessert spoonful to half a pint of milk, whisked it up and drank it. Tasted fine. Let’s see if the affects are beneficial.